The British Proclamation declaring protectorate over the Cook Islands, signed in 1891 (although declared earlier in 1888) returns to Cooks after restoration in Auckland. 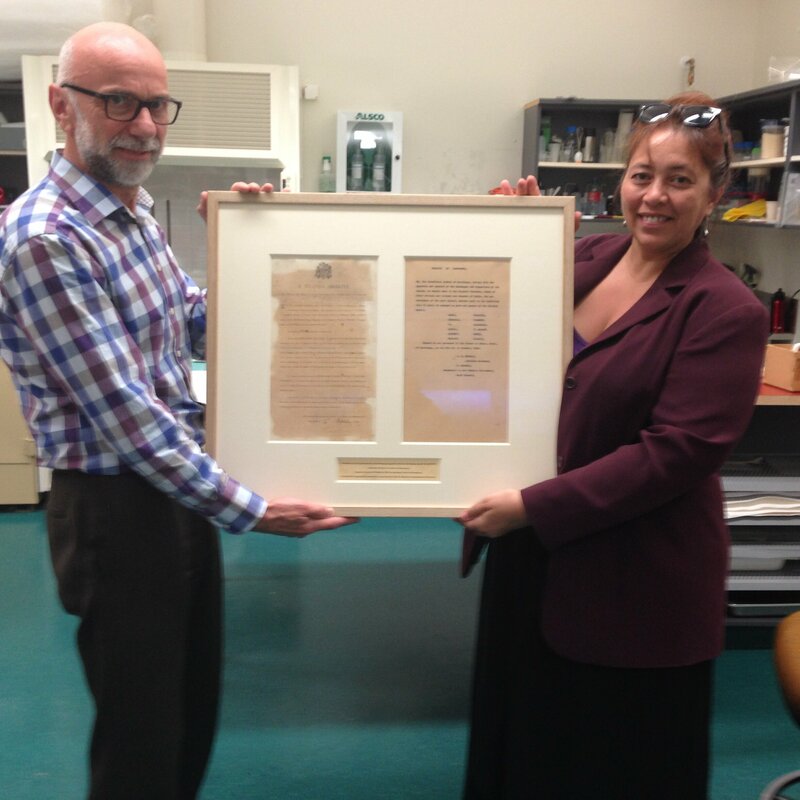 Jean Mason, curator-manager of CI Library & Museum Society Inc (CILAMS), Rarotonga, returned recently from NZ with the document, property of CILAMS, which was taken to NZ for conservation treatment 6 months ago. It didn’t actually take six months to restore but it is so delicate and rare that it couldn’t be posted back once finished, says Mason. It had to be hand carried both ways, so it was waiting in Auckland for someone to uplift it once treatment was completed. Mason would like to publicly thank UNESCO for making it all possible – from the UNESCO workshop in Cambodia in November 2013, with a panel of experts to advise on how best to get this document recognised and placed on the MOWCAP-UNESCO register (Memory of the World), to the eventual conservation treatment by Mr David Ashman of Auckland Public Libraries. It was one thing to get it on the Register but it was another to get the document restored, says Mason. Fortunately for CI Library & Museum Society, Dr Ros Russell saw their plight and it was she who initiated the project for conservation. 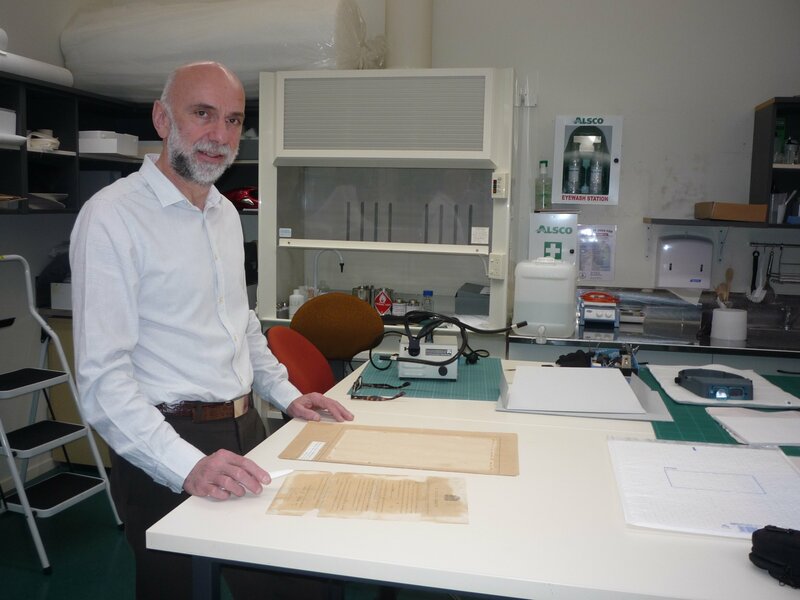 Much thanks goes to David Ashman of the Auckland Public Libraries, Auckland City Council, who carried out the conservation treatment, to Dr Ros Russell, and the Australian MOWCAP branch, who paid the conservator’s fees. CI Library and Museum Society’s thanks also go to Sue Cooper of Remuera Heritage in Auckland, NZ, for her invaluable assistance and Thailand’s MOWCAP Branch, which paid for the conservative framing. Previously, the document was brown with age and crumbling each time it was handled. Now, according to Mason, Mr Ashman assures us that the document will last another 200 years if kept away from moisture, fire and UV light. This entry was posted in Exhibits, History, News. Bookmark the permalink.